The Catholic University Student Government Association (SGA) held its executive elections Wednesday April 11th. 827 Catholic University students voted on the third floor of the Pryzbyla Center and on the Nest website from 9 AM to 9 PM throughout the day. The “Representing Catholic You” ticket, made up of Jimmy Harrington, Weston Kirby, Brendon Dillon, and Sophie Czerniecki, won the election. Election results were announced to a group of about 50 students late Wednesday night from the third floor of the Pryz in front of Starbucks. For the 2018-19 academic year, Harrington will serve as SGA President, Kirby as Vice President, Dillon as Treasurer, and Czerniecki as Secretary. Harrington and Kirby ran against junior accounting majors Justin Smith and Abby Maser for the presidential election. Dillon ran against sophomore international economics and finance major Jean Marie Higgins. Mary Schmitt, a junior marketing major, was also elected to be President of Program Board. She ran unopposed. Both Representing Catholic You and “Smith-Maser” participated in a debate The Tower held on Thursday, April 5th. Throughout their campaign and the debate, Smith and Maser ran as ‘outsiders’ to student government. Both candidates stressed their desire to make SGA more of a liaison for student organizations and campus involvement. This was in contrast to Harrington and Kirby, both of whom have held leadership positions on the SGA senate, and wanted SGA to continue being a voice for the students. The four Representing Catholic You candidates ran together, making them the second consecutive executive team to run as a group. The SGA executive branch represents all Catholic University undergraduate students with the elected positions of President, Vice President, Treasurer, and Secretary. 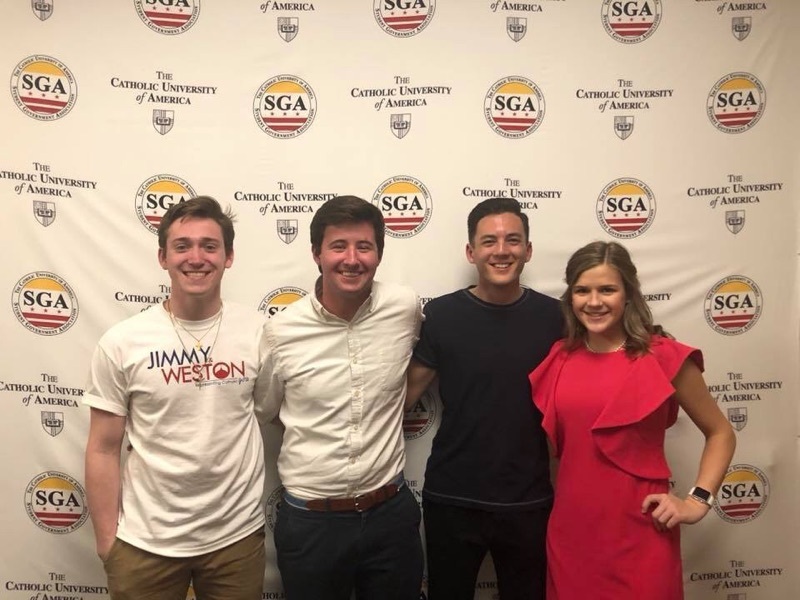 The current administration, made up of Brianna Howard, Jon Paul Weiss, Sam Galvin, and Victoria Principato, had a successful run last year with the four of them campaigning together. On the ballot itself, the treasurer and secretary are voted on separately from the president and vice president. The success of the Representing Catholic You campaign suggests that running with all four candidates together may be more than just a trend. Harrington, a junior economics major, was ecstatic with the results. In a presidential run last year, he and his running mate, Aaron Mackisey, lost by 28 votes to the current administration. “I feel really excited about my team and the success we were able to have, but most of all I’m excited about the future of this university,” Harrington said. Current Vice President and senior politics major Jon Paul Weiss commended both campaigns for a fair race. “Both campaigns worked really hard today and the results reflected all the work they put into the whole year,” Weiss said. On the morning of election day at 9 AM, both campaigns had tables outside the Pryz full of free things including cups and cookies. All over campus were friends and supporters of the candidates, wearing campaign t-shirts and telling students to go vote. The elected candidates have outlined their goals on social media for weeks. In terms of policies and initiatives, they plan to focus on getting more student jobs, locking in the price of student housing and dining, meeting the financial needs of student organizations, and making sure the university has the resources it needs to help victims of sexual assault. Czerniecki expressed a goal to connect the university’s students with the initiatives of the student government to greater represent the student body. The future executive must have their proposed budget for the next senate meeting on April 23rd. The proposed budget must consist of the entire SGA budget for the 2018-2019 academic year. At the end of April, the transition process will officially begin with the current executive members meeting with their counterparts. Treasury Board has a quick transition with members chosen by the end of the semester so they can vote for allocation requests over the summer. “Our counterparts from last year helped us out with a smooth transition and I think it is important to do the same,” Weiss said. SGA president-elect Harrington realizes the university may have a challenging year ahead of it. He feels that listening and being available to other students will be paramount in the SGA’s year-long efforts. “We want to bring in every voice we can and listen to every person so everyone feels the home here that we do,” Harrington said. All four candidates will officially be sworn in on May 1st.